Time for another trash to treasure project. 🙂 I found this hook rack at the thrift store for $1.50 a few months ago. I sorta forgot about it. Being that it is the new year, I am in the process of de-junking and organizing our home. I stumbled across this in my “projects to get done so we can walk into the room again” pile. 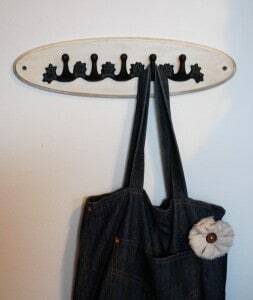 And I was needing a new place to hang my bags. Yippee!! I unscrewed all of the hardware and gave it a good scrubbing. The hooks still had traces of stain on them and it looked sloppy, so I sprayed them with a quick coat of black spray paint. I lightly sanded the wood, then sprayed it with Antique White spray paint. 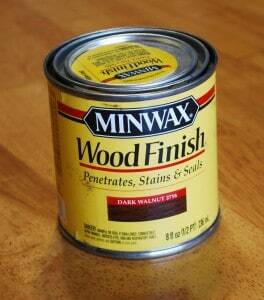 I have found that it takes several coats when you are spraying wood that has been stained. Anywho, after it dried, I thought it looked a little plain. Much, much better, doncha think? Here it is with one of my bags hanging from it. Love my newly made over hook rack!